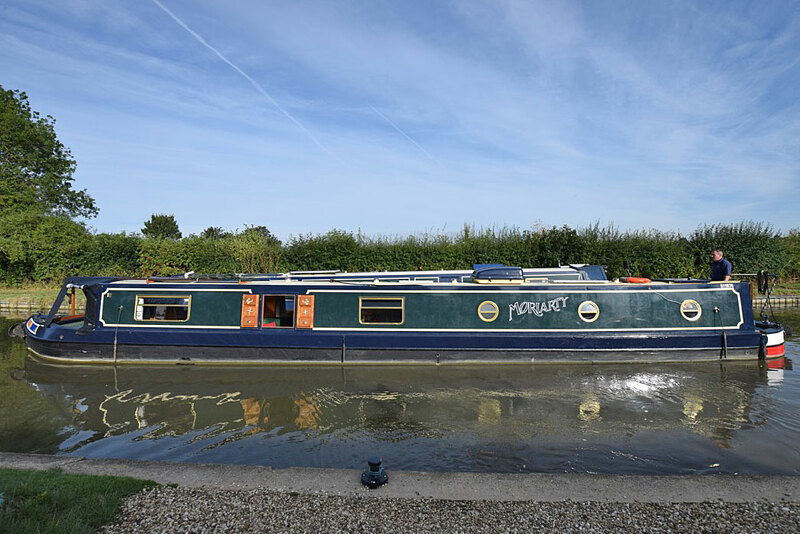 Moriarty, stunning 58′ Trad 2004 G&J Reeves, is a 58’ ‘go anywhere’ traditional style narrowboat in beautiful condition, both inside & out. She was built by G&J Reeves in 2004 and has had only two owners from new. She has been loved and cherished by both of them – and it shows. The well deck has a very good condition cratch cover with flexiglaze windows, and has storage under the seats. The carpet in here gives it a cosy feel and a nice entrance into the saloon. Fitted out in oak faced ply with sapele trim, the woodwork is first class and gives the boat a luxurious feel. The saloon is 10’7” long and has good storage space along with two leather captains swivel chairs, a footstool and a Bubble diesel stove. There is a TV / DVD combi in the corner. The dinette follows. This is a lovely arrangement with side hatch, storage and a freezer under, and converts into a spare double berth. The galley has another side hatch on the starboard side and also hosts a full size washing machine, eye level oven & grill, gas hob, a fridge and microwave. There is also storage a-plenty in this room. The sink has a filtered drinking tap. The shower room is off the starboard corridor. The loo is a brand new (unopened) Porta Potti Cube with spare cassette, the basin is ceramic, the shower is glass doored and tiled and there is an airing cupboard next to the shower. The bedroom is large at 9’5” and has lots of storage space in it. Under the bed, over it, cupboards and a wardrobe at the foot of the bed…it’s all here. There is also another TV/DVD machine at the foot of the bed. The aft cabin is last. A really useful room housing the engine (super cacooned & very quiet), and various cupboards. The electrics (including 3kw Victron inverter) are in here. Lighting on board is all LED (including under gunwale lights in saloon & bedroom). There are 6 radiators on board (Eberspacher diesel fired) to supplement the Bubble stove if required, there are 100w of solar power charging the batteries, and a galvanic isolator on board. She is such a charming boat, well loved, well looked after, and ready for immediate occupation whether it be for living aboard or a holiday boat. She is a credit to her current owners, and will be to the next. Moriarty, stunning 58′ Trad 2004 G&J Reeves – what’s not to like!